In winter in Berlin, two complementary events share the same public: Transmediale is dedicated to digital arts and cultures and the CTM Festival focuses on sonic practices and electronic music, not to mention partner events and other galleries in the centre of Berlin worth visiting. The Transmediale in Berlin has gradually evolved over 27 years of existence. Video practices have naturally given way to digital culture. Kristoffer Gansing, the artistic director of the event this year, which focuses on our Post Digital era, considers this 2014 edition the "diagnosis of the current status of digital hovering between "trash and treasure"." 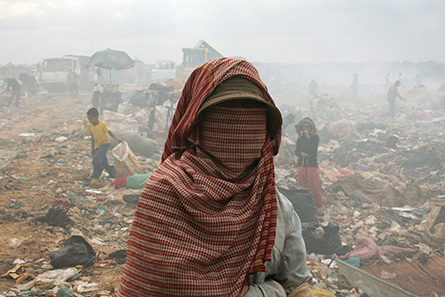 Hence the choice of an anonymous portrait photographed by John Einar Sandvand on a background of a dump in Phnom Penh as an identity marker for the Transmediale 2014. The aesthetics of the discharge perfectly symbolise the e-waste that artists Michael Ang and Jonah Brucker-Cohen assembled to "revive" during the workshop "Art Hack Day", grouping about 80 participants at the Kulturen der Welt der Welt during 48 hours. But it also evokes the unloaded data on URL shortening services that Justin Blinder and Benjamin Gaulon, who is very attached to the practice of recycling, manage to eradicate without permission. Digital technologies, in this Berlin winter, are therefore at the centre of debates about monitoring data and people, between Big Data and Big Brother. Conferences and panels, such as that grouping Jacob Appelbaum, Trevor Paglen and Laura Poitras follow one upon the other at Haus der Kulturen der Welt. As for the festival catalogue, entitled "The Afterglow", it features some photographic images from the series "Untitled (Reaper Drone)" taken by Trevor Paglen from a great distance. 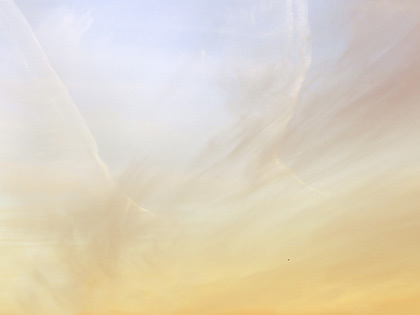 And there, among them, the image of a morning sky whose milky aspect evokes the atmosphere that pervades the Punta della Dogana painted by JMW Turner in 1843. But we understand from the title of the series by this American artist that it is an element to be discovered in the image. What interests Trevor Paglen is the visible part of the secret activities of the government, or the army of the United States. Because it is not difficult to know where these observation or combat drones take off, piloted by young soldiers with controllers similar to our video game consoles, participating in "offshore" armed conflicts from the Creech air Force base in Nevada. Thus Trevor Paglen, watching those who watch us "in secret", photographs skies to which tiny details that are hardly visible barely manage to withdraw it from abstraction. The CTM festival has emerged from the Transmediale to finally gain its independence by investing institutions like Künstlerhaus Bethanien where the exhibition "The Generation Z: Renoise" took place, organized by Andrey Smirnov on the emergence of sound art in the Russian avant-garde. It features, in particular, the film "Enthusiasm" (1930) by Dziga Vertov whose soundtrack is the first historical record of what the practice of field recording is now called. The director recorded urban and industrial sounds by himself with a mobile device in 1929. One can also play the musical instrument designed by Léon Theremin in 1919 in another room of the Künstlerhaus Bethanien, without even touching it, managing the volume with the left hand and the pitch with the right hand. The Theremin, which is among the oldest electronic musical instruments, was highly appreciated by music composers of science fiction movies of the 50s. 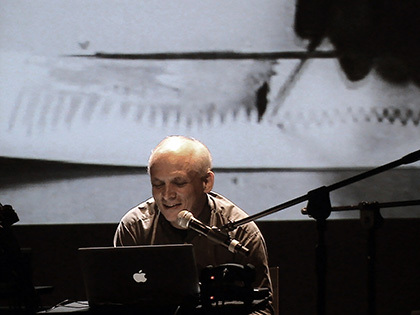 This exhibition reveals the historical origins of the correspondence between graphics and tone through soundtracks literally drawn by Arseny Avraamov ("Ornamental Sound" from 1929 to 1930) that the generation of sound artists today have reactivated with the use of digital technologies. The Ernst Schering Foundation, dedicated to bringing together the arts and sciences, is a partner of this Transmediale with the exhibition "An Ecosystem of Excess" by Pinar Yoldas. 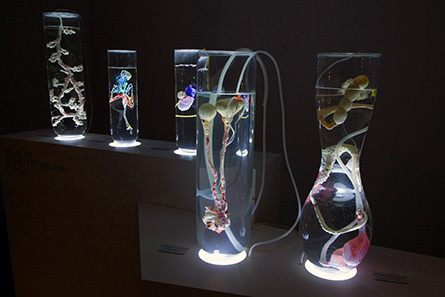 This researcher artist, native of Turkey and living in the United States when not in residence in Berlin, presents the organs and species of a "speculative biology." Considering the essential role of the oceans in the emergence of life on Earth, according to the theory of the primordial soup, and knowing our ability to pollute them with ever increasing amounts of plastic, she examines the existence of the vortex of waste discovered in 1997 by oceanographer Charles J. Moore in the North Pacific. "The ocean, according to him, has been turned into a plastic soup", so Pinar Yoldas has imagined plastivore or plasto-sensitive organs. Everything in her eco-system of excess, is coloured, right through to the bird feathers in Pantone colours while she wonders what life forms might emerge today from this "contemporary primordial ooze" that our oceans have become?" 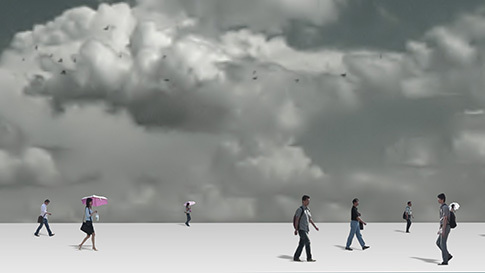 The exhibition "Schizophrenia" dedicated to the Taiwanese new media art scene, which is at the Collegium Hungaricum, is among the partner events of this Transmediale 2014. It was organized by four curators, including Pierre Bongiovanni now supporting the media arts abroad as he has been doing in France since the 1990s. Previously unveiled during the Ars Electronica festival in Linz and the Cyberfest festival in St. Petersburg, it will soon be presented at the Maison des Metallos in Paris and then at Instants Vidéo in Marseille. Among other things, we find the multichannel video installation "The Unconscious Voyage" by Wan-Jen Chen. The world it represents is flat, grey and infinite. The people who live there are only passing through. They move quickly, strangely rushed by a stretched time without beginning or end. Nothing can disturb them or remove them from their personal stories. As if their lives were parallel to one another. Consequently, there would be no chance for them to intersect. This scene evokes the ordinary mornings in the corridors of Penn Station, the Gare du Nord or Shinjuku...when ignorance prevails over sharing. In the district of Mitte in Berlin, there are a few galleries including CMC and Eigen + Art Lab who recently set up in an old Jewish girls' school that has just been renovated (Auguststraße 11-13). 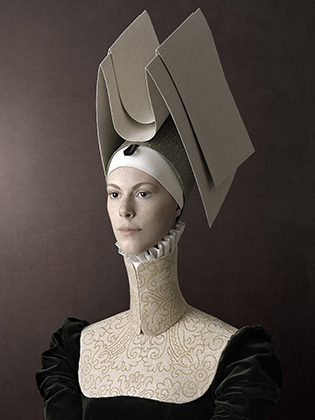 The "1503" series by the artist Christian Tagliavini can be seen there. The number around which the nine photographic portraits are joined evokes the year of birth of the Florentine mannerist, Bronzino. It took Christian Tagliavini over a year to complete this series of portraits that date from the High Renaissance. He patiently crafted caps, collars and dickies out of cardboard, as Thomas Demand does before fixing his sets to images. Many painters like Jean-Baptiste Ingres, were inspired by the liberties taken by the 16th century mannerist painters in the representation of the body. "Lucrezia" seems to have too many vertebrae, as is the case for "La Grande Odalisque" by Jean-Auguste-Dominique Ingres. The brush strokes of software publishers in fashion magazines are as equally suited to anatomical changes as those merchants of colours of yesteryear. As for the looks of the models, which are oh so timeless, they are resolutely contemporary. 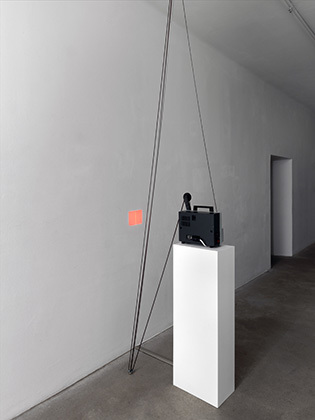 The exhibition "Still (not) moving" of Eigen + Art organized by the curator Dieter Daniels, brings together a few artistic proposals situated precisely between photography and film. The 3-minute 8-millimetre film loop projected in the gallery was taken with camera in hand at the MoMA in New York by artist Albrecht Pischel. This sequence shot represents the painting "Vir Heroicus Sublimus" (1950-1951) by Barnett Newman. Over time, consecutive vertical stripes produced from wear, come to add to those originally painted by the American artist. No one can visually separate those of a pictorial nature from those that are filmic. Another proposal by Albrecht Pischel features a 16mm camera projection in which the image evokes photographic scenery of the American West, where there is a waterfall that we learn is one of the mini-applications that Apple provides with its operating systems. "Yosemite" its title, is even more monumental in the fragility of its analogue demonstration than it is on a flat screen. The device which depicts it creating distance in space and in time, it thus appears to us more distant. Finally, members of the Belgian collective LAb[au] exhibited in the DAM Gallery Berlin as they just did with René Denis in Paris. The first gallery being dedicated to kinetic, while the second is involved in digital, this double presence only reinforcing the idea that digital artistic practices are part of a historical continuum. Artwork "m0za1que 4*4*4" is composed of a grid of vertical planes, which are driven independently of each other to create all together, mechatronic choreography. But the shadows shown that are produced by their movements are coloured by three light projectors. Red, green and blue, they colour the shadows of their complements as Claude Monet loved to do between 1892 and 1894 by painting Rouen Cathedral at different times of the day. Not to mention the experiments of Nam June Paik in which video projectors did not last for long as he kept pushing them beyond their capacity so that in the image, flames would multiply ("Candle Projection", 1988). Lab[au], like Monet, work the series meticulously so that their aesthetic doesn't run out. 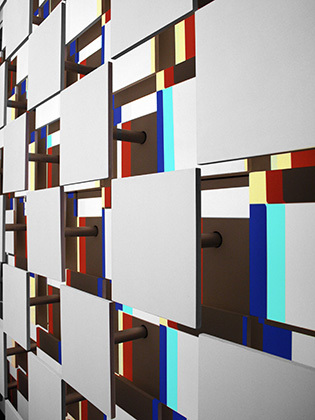 Using technologies of their time, they contribute to the sustainability of a kinetic trend they renew with each series. Written by Dominique Moulon for Digitalmcd and translated by Geoffrey Finch, March 2014.